Iranian people deserved better than man who calls for death of Irani nation with most idiotic statements possible. HORROR !!! TRUMP IS KRETENOID...DEMENTED IMBECILE FOR SURE(aint slightest doubt about it - whole world knows it), BUT CALLING FOR DEATH OF AMERICA AND USING "TRUMP" AS PRETEXT IS EVEN MORE IDIOTIC. ITS WHAT TRUMP WANTS, SO HE CAN DELETE YOU FROM FACE OF THE EARTH. Trump(as weak and sick as one is) made and is making fortune because of losers like yourself Mr. Ayatollah Ali Khamenei. You also ruin with your public conduct my work and work of other activists Mr. Ayatollah Ali Khamenei...Iran should move on with continuation of Mohammad Reza Pahlavi's politic which was ruined by losers like yourself. Rather than supporting self destructing Kremlin's politic of radicalism. Israel is thankful for Ayatollah Ali Khamenei...you damaged Iran big time sir and you will get one erased with you presence on political stage. You want to play THIS https://ausertimes.blogspot.com/2018/07/its-just-game-would-you-like-to-play.html type of the game also in Iran sir !!???? 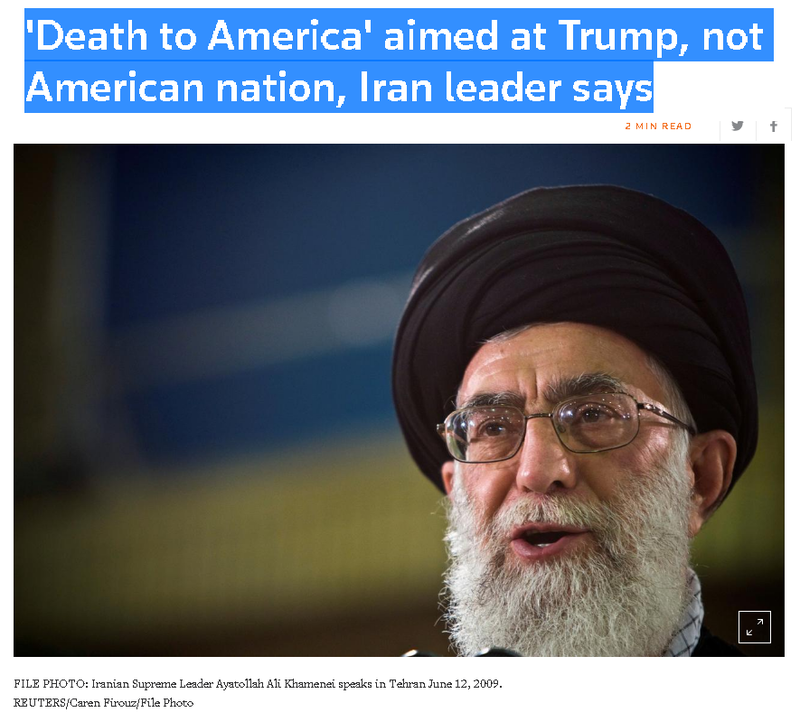 DUBAI (Reuters) - Iranians will chant “Death to America” as long as Washington continues its hostile policies, but the slogan is directed at President Donald Trump and U.S. leaders, not the American nation, Iran’s supreme leader said on Friday.